Rick Smolan is known for his book series A Day in the Life of …, a project that started decades ago. He was recently interviewed by Scott Galloway of L2 to talk about those books, his newest project The Good Fight: America’s Ongoing Struggle for Justice and the business of photography. Smolan pulls no punches here – the business model is not working anymore. But as I sat through this, thinking about how we old timers lament the days of re-licensing work and sustainable day rates, I started to wonder how we should teach the business of photography going forward and whether we need a zero-base approach to it. Day rates aren’t what they were, clients want more rights than before, their needs are different due to emerging platforms and so many of us still talk about holding on to the business model of the 20th century … maybe, just maybe, we need to think about a different way of doing sustainable visual storytelling. I have no idea what that way is, but it seems like something we should talk about at least. By now, you’ve seen the video montage that Deadspin created, with anchors from dozens of Sinclair Broadcasting Group stations reading the same corporate-issued script. You’ve seen the response from media associations like the National Press Photographers Association (and seen the consequences of that statement), you’ve read the analysis from folks like Al Tompkins at the Poynter Institute. By using news time for what is a promo or “public service announcement,” you’re cutting into your service to the community. Quality journalism dictates that you identify the source of your information. Neither the source of this script nor evidence of the “troubling trend” are provided. Did KOMO review the information this report is based on? Allegedly, Sinclair did a survey – did anyone at KOMO look at the results? Did they look at the methodology? Did they talk to a survey expert about the sample size and composition? Did they ask about any implicit bias in the question structures? “Factual reporting is the foundation of our credibility” – that’s a powerful and true statement. But when you do not identify the words coming out of your mouth as being someone else’s, when you do not verify the data upon which those words are based and when you do not identify that these are coming from outside your newsroom, outside your news station and outside your community, you lose that credibility that you claim to need. This is the soft close, this is the, “we’re listening to you but not telling you all we know” finish to make the audience feel good. Broadcast stations are considered public trustees – because they use airwaves that are owned by all of us, there are certain standards they need to meet, certain obligations they need to fill. As more and more are owned by large corporations (Sinclair currently owns 193 television stations and is in discussions to purchase 40 more), there is a conflict between the public trustee role and the demands of corporate cultures. Sinclair didn’t cross any legal lines here, but an ethical one has been bridged. Local news organizations should be reflective of and responsible to their local communities. The benefits of corporate ownership should be in taking advantage of scale for business purposes, not in taking advantage of scale to push a political agenda that may not be reflective of the communities. Having local anchors read a corporate-provided script decrying that, “some members of the media use their platforms to push their own personal bias and agenda” is the very epitome of hypocrisy and erodes any credibility those news organizations may have. So what do we do? As an educator, I advise my students to research the entities that are offering internships and jobs beyond just the basic info of location, market share or pay scales. They need to do a deep dive into the newsroom, the local organization and the corporate philosophy. More so on the broadcast side than on the print side, journalists may have to sign contracts that stipulate everything from how much they’ll be paid to how they can – or cannot – move-on or quit. I ask my students to look deeply inside themselves, to see if this corporation is a company they would be proud to represent because it will be their name, their likeness, that will be the public face of that company. A good working environment and culture will go a very long way to make you both happy and successful. Salary alone doesn’t dictate job satisfaction. I surround myself with journalists, journalism students and journalism educators by choice because we share a common ethical framework and a deep desire to help our local communities, to ask questions in our local communities and to seek answers in our local communities. I appreciate that working for the University of Georgia gives me access to certain benefits because of the scale of this operation but I also appreciate that I am given the ability to work with and react to my immediate constituents – the students and, by extension, the citizens of the state. Corporate ownership of news organizations is not inherently evil, corporate dictates that do not reflect local priorities is, though. As a public trustee it is incumbent upon corporate owners to allow local operations to reflect the values and needs of those local consumers. If they don’t, they are participating in yet another form of propaganda designed to control what people think. Michael Shaw has an interesting take on the six World Press Photo finalists over at Reading the Pictures. There is not one photo that begins a dialogue, that poses a question, that does anything other than hit us upside the head. The question of what’s the purpose of an image is a long, deep one. Is it just to document? My belief is that a great new photograph is designed to inform, to educate and to resonate. 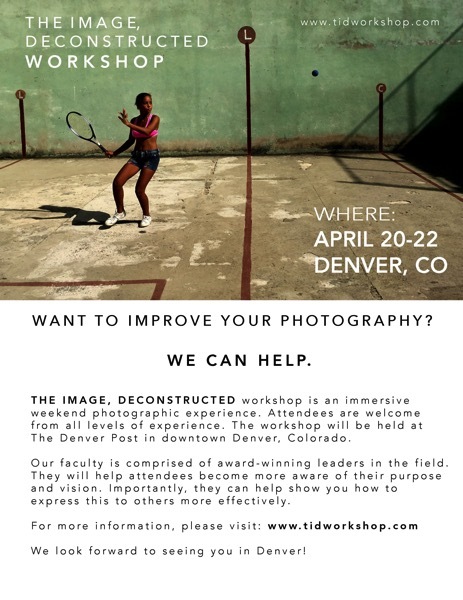 THE IMAGE, DECONSTRUCTED workshop is an immersive weekend photographic experience. Attendees are welcome from all skills levels. The workshop will be held at The Denver Post in downtown Denver, Colorado. Our faculty is comprised of award-winning leaders in the field. They will help attendees become more aware of their purpose and vision. Importantly, they can help demonstrate how to express this more effectively.